Those pictures on Instagram or Pinterest seem surreal! Pools up in the sky like being weightless. Large glass bottoms open the view into the water from underneath. Swimmers being observed like moving through the air - hence the term Sky Pool. Glass bottom pools are real, actually. And there is a company that makes them: Hydrosight is the market and technology leader when it comes to installing glass bottom pools. It is essential to be able to build on a partner like Hydrosight for such an operation. Still, it remains teamwork between architect, general contractor and pool builder. Together with Hydrosight this unique attraction will become a success. 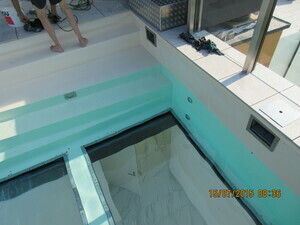 Glass bottoms for pools are actually just a variety of Hydrosight's underwater window product range. Internally Hydrosight refers to them as horizontal windows, in opposition to vertical windows, that go into the pool wall. Horizontal windows can be installed in any kind of pool, no matter if tiled, liner or other. 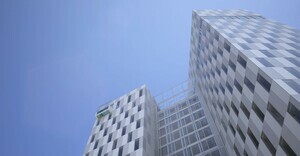 Single glasses are common, but also arrays of openings to form even larger windows. 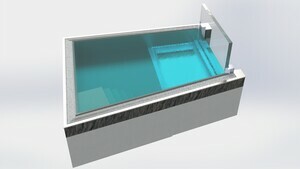 Many skylights are installed in rooftop pools. Natural light is directed into the rooms below. Some pools are for swimming, some are shallow, reflecting pools. 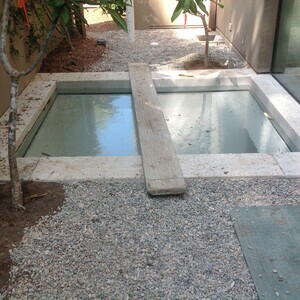 Hydrosight has documented installations of sky pools in the UK, in Israel, Finland, Austria, in California and in Florida. Some of them can be found in the related projects list at the bottom of the page. Where are you located? Contact Hydrosight sales to help with your building plans. 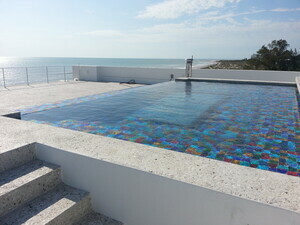 A glass pool might be a realistic option for what you have in mind!